Urban population is rapidly reaching two thirds of the global population; thus, cities are the core of a change that need to be driven: the rapid urban population growth involve a large energy consumption and high greenhouses gas emissions which drive cities to face environmental challenges like as climate changes and energy resources’ scarcity. As remarked by the last Report of the United Nations on Sustainable Development, climate change is one of the greatest challenges of our time and adequate strategies capable of mitigating and adapting to its impacts represents an immediate and urgent global priority. 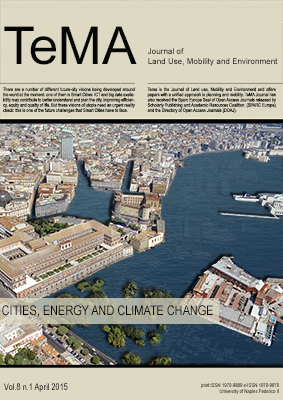 This issue of the TeMA focues on the topic of Cities, Energy and Climate Change, focusing on current strategies addressed to mitigation and adaptation.